This dissertation presents a model of lexical category determination based on properties of argument structure. To start with, there are two types of lexicons – functional and conceptual. Members of the conceptual lexicon are category-less roots which encode concepts. For each concept its thematic properties are specified in terms of .-features [±c] and [±m] forming feature clusters. Each feature cluster corresponds to an argument of a predicate that is conventionally saturated by merging a DP in the syntax. Thematic properties of a concept determine whether it will merge in the syntax as a noun, adjective or verb. Non-predicative concepts associated with arguments will be categorized as nouns, predicative concepts with one argument as adjectives and predicative concepts with more than one argument as verbs. Thematic properties (number of arguments) are rooted in causal relations into which concepts enter: necessary/sufficient conditions associated with a given concept are translated as .-feature clusters. The proposed model presents an extension of the Theta system developed in Reinhart (2000-2003). TS maintains the view that operations on argument structure can take place both in the lexical and syntactic modules. This is in stark contrast with an approach to argument structure entertained within e.g. Distributed Morphology which strips the lexicon of all computational powers. The dissertation, however, presents numerous arguments in support of the computational lexicon. 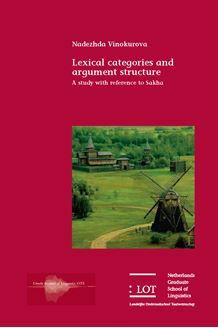 This study is of interest to linguists concerned with lexical categories, argument structure, morphological derivation and the interface between lexicon and syntax. It is also of interest to scholars working on Turkic languages.